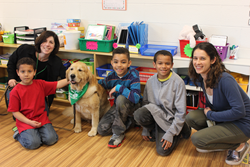 The Human Animal Bond Research Institute (HABRI) and Green Chimneys announced the publication of a study exploring the effectiveness of an animal-assisted social skills intervention for children with Autism Spectrum Disorder (ASD). Research was conducted at Green Chimneys, a therapeutic school and treatment center for children facing social, emotional, and behavioral challenges. Findings demonstrate that incorporating therapy dogs in social skills training is a valid approach to teaching children with ASD to engage with peers and improve social interaction.